The Responder Safety Learning Network is pleased to announce that it will be adding a Secondary Reporting Program, which will allow organizations to directly access the training transcripts of their members who opt in. An organization will simply sign up for the Program and designate which supervisors are authorized to view training results. These supervisors then securely log into an administrative page where they can search, view, and download the module completion transcript for all members who agree to have their results reported to that institution. No information is released without the user’s explicit consent. 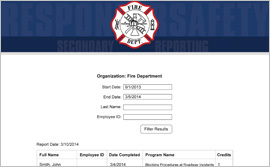 The Secondary Reporting Program benefits both members and organizations. Members can now be confident that their supervisor knows what training modules they have completed and, therefore, that their continuing education credits are properly recorded. Members no longer have to print and submit paper certificates; their full transcript of completed modules is accessed electronically directly to their supervisor. Supervisors have one-click access to training results for all opt-in members, enabling the supervisor to closely monitor their members training progress and work with members to be sure they are taking the training they need and/or the training that the organization requires. Organizations can be confident that their members have completed the modules, and earned the associated CE credit, because the results are independently reported and are verifiable at any time. In addition, supervisors can download a digital file of training results for import into the organization’s own LMS. The independent verification provided by the Secondary Reporting Program is critical to proving training completion to oversight bodies, government officials, and the public. It has never been easier to have certifications and continuing education require the vetted modules provided by the Responder Safety Learning Network. In preparation for launching this feature, the Responder Safety Learning Network is soliciting interest from organizations that may want to participate in secondary reporting. This is an excellent opportunity to be part of this program from the ground up and be one of the first organizations to offer this convenient feature to your membership. To learn more and to contact us about joining the program, click here.